Made-to-measure: We supply packing tables from the well-known brands and from our own customized production with an extensive list of options such as side tables, sliding sheets, roll holders, box shelves and other accessories. Of course, the materials used are of a particularly strong industry quality for frequent, heavy use. Also in terms of design and colors you can express your wishes so that we can take this into the design. German quality: The complete collection of the German brand Hüdig + Rocholz is included in our delivery program. This includes various series of packing tables in various price categories, all of excellent quality and with various possibilities for expansion. On request we send you the brochure with the complete range of packing tables and related items. Also check out the website of Hüdig + Rocholz for the current range of packaging solutions. Projects: Customized solutions are usually desirable for large projects. If you want to furnish a complete production hall or warehouse, there is a lot involved. We like to think along the drawing board about the right solutions for an optimal workflow and perfect working conditions. The packing tables themselves are often part of a complete packaging line. We also supply the systems for product buffering (air / paper), automatic box closers, roller conveyors and palletising systems. Deze compacte budget paktafel heeft 1,3 m² werkbladruimte. De lengte is 160cm, de diepte is 80 c.. 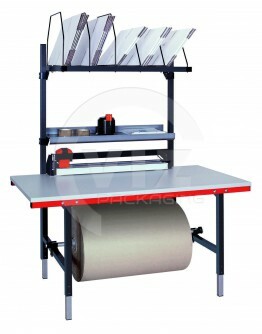 Packing table SYSTEM 1600 with add-on cutter. 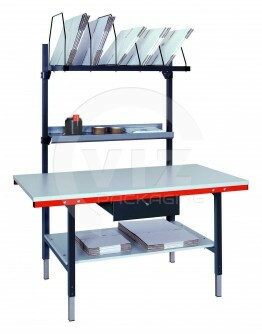 SYSTEM 1600 are sturdy and robust packing tables made as all-in-one solutions with a steel construct..